By popular local legend, the architect Kearns Deane gave his services free, although he was not a catholic. Perhaps as a member of the local Deane family of architects, he was loath to lose the commission to an architect from outside of Cork or even to one of his local competitors. 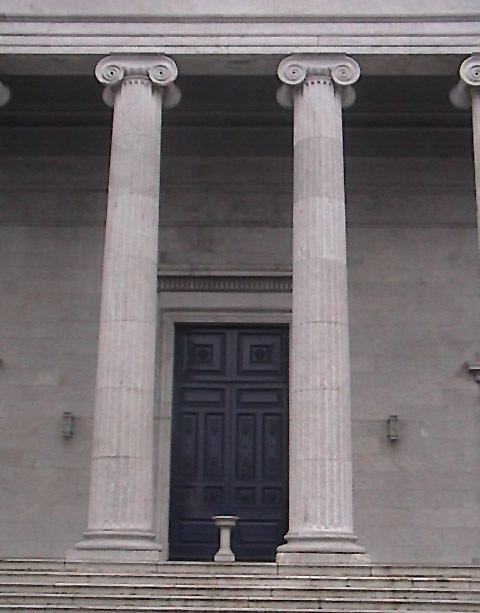 The church was begun in 1832 and opened in 1839, although the portico was not added until 1861. The portico was completed by Deane and Woodward who omitted the flanking towers and dome over the crossing that was originally intended. It is to detriment of the city that these were not completed. While the exterior order is Ionic, the interior columns are Corinthian, and the interior was altered by George Goldie in 1861 and by S.F. Hynes in 1895. On the altar inside, is a 14th century statue credited with miraculous properties. The 6cm Our Lady of the Graces statue was made in Northern France and is said to have floated in a log into Youghal in the 15th century. There it remained until it was moved to St. Mary’s. The statue of Our Lady on the pediment is by James Cahill of Dublin.